A multi-level carpark will be built at Ferntree Gully train station. A multi-level carpark will be built at Ferntree Gully train station under a $60 million Federal Government plan. Prime Minister Scott Morrison, Federal Member for Aston Alan Tudge, and Federal Member for Deakin Michael Sukkar announced the parking improvements on 7 February at Croydon train station. The plans expect 400-500 extra all-day parking spaces to be built at Croydon, Ringwood, Ferntree Gully and Mitcham, and an average $15 million will be spent at each site. The carparks will be paid for through the Federal Government’s urban congestion fund and planning and is expected to begin immediately. Mr Tudge said the new carpark would fix the problems at Ferntree Gully and also take pressure off the Upper Gully station carpark. 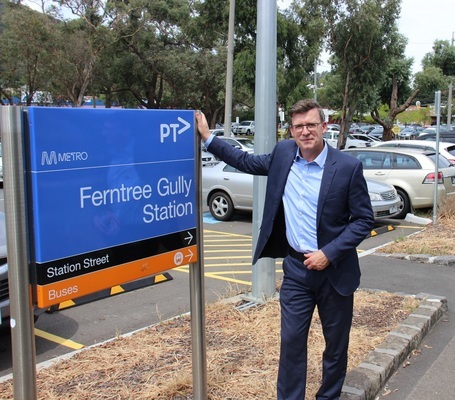 “I have secured $15m which will allow us to construct up to 500 carparks at Ferntree Gully station,” he said. He said that the extra car spaces would ease early-morning parking woes for commuters, and commented on the station being at capacity before 7am. “The new carpark is likely to be multi-level, as this is the only way to increase the capacity. “The carpark will remain free and the design will be developed in close consultation with local residents.